Sorry for the long wait, but it took me a while to figure out how I was going to pull this one off. At first I was hoping I could get away with just doing one “Sunday format” strip, but soon concluded that there was no way I was going to be able to cram everything I wanted in one dinky strip. So then I thought I’d do three super-long (i.e., a lot longer than the Sunday format) strips — one for each “Invasion of the Vorticons” game, but that would have taken way too long. So I ended up settling on doing just one super-long strip, and had written and planned it all out when I saw that it could easily be broken up into 5 Sunday strips. 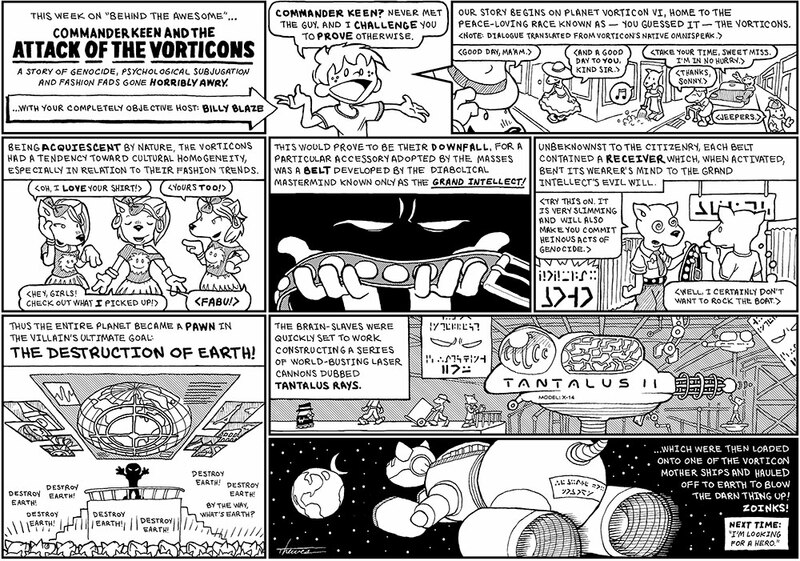 So that’s what you’re getting: a 5-comic-strip retelling of “Invasion of the Vorticons”, the first of which is above. Among my other excuses for being late are that I was sick and then I was out of town for a while and blah blah blah cry me a river. Suffice to say the next four should arrive on schedule.